Discussion in 'Shower & Bathtub Forum & Blog' started by CeeTee, Jan 7, 2019. Apologies if this isn't the right section to post to, and apologies also for the length of this post. I'm completely gutting our 3rd floor bathroom in our 1925 Victorian twin in Philadelphia. So far I've removed the old tub, old fiberglass shower stall, radiator, toilet, floor tile and the partition wall / framing and I am now getting into the actual workings of the bathroom which unfortunately is a bit of a state with multiple patch jobs done over many years. Ultimately, I will have to do joist repair and sistering as the old work joists have been severely notched across several of them to install the shower and tub drains and the toilet. My plan is to completely remove the tub drain pipe as we are not replacing the tub and add a new tiled shower (KBRS pan) in that area so I would move the shower p trap to this area, shortening the distance between it and the vent as I believe it is too far away currently. The current shower p trap is further than 8 feet away from the vent which is on the other side of the wall behind the toilet. Also currently both the tub and shower drains are connected (pic 01) to the toilet waste but the connection to me seems to be only 1 1/2" connection so the 2" shower drain has been reduced down to 1 1/2". Q1. Can I merely cut off the tub drain pipe at the yellow circled area and cap it? Q2. If I add a new shower p trap and drain in the general vicinity of where the old tub drain is located (pic 03) will this properly vent the shower? 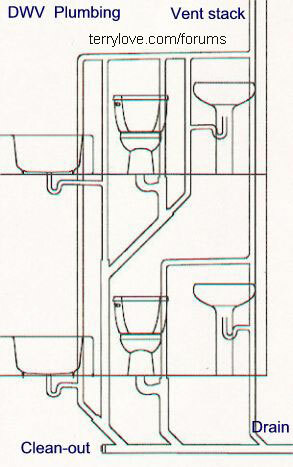 Would I need to adjust the toilet waste pipe with a new fitting such as a combination wye instead of the current configuration. Q3. If I need to change the configuration at the toilet what would be the optimal place to cut the pipe there - can any of it be salvaged? I hope this made some sense and thank you for any assistance and guidance! The fitting coming off the 3" should have been a 3x2 wye. The shower p-trap needs a vent before entering that line. You could wet vent the shower with the lav, if the piping was 2" and not the 1.5" that is there. The lav needs a vent. Thanks Terry - I had a feeling that something like this would be the case. I'm very much learning as I go along with this house, so apologies for the newbie dumb question, but if I wet vent to the lav using 2" pipe - are you meaning that a new completely separate vent, independent of the main cast iron stack, and going up through the roof would have to be added for these two fixtures? (we recently had the roof resurfaced - hence why I just wanted to be clear!) Many thanks again! Where is the lav vented now? For a wet vent, the wet portion would be 2" and the dry vent can be 1.5" if it's for the lav/shower combination. Hi Terry - I would need to investigate this now that the floor is a bit more open (I hope it is vented!). The lav pipe (i'm assuming) is heading towards the main stack under the floor, running next to the toilet drain. but in view of how bad everything else is I can't be sure. - I'll have a look. If you give me a worst-case scenario and it is not vented at all what would be the least painful option(s)? This bathroom is on the 3rd floor right under the attic. Thanks! The vent for the lav p-trap would be higher than the p-trap. Normally those vents to through the roof at some point. You can also use an AAV for a lav vent and shower vent. Those should be at least 4" higher than the lav trap arm. Many thanks - I've been trying to read through the Philadelphia code but I don't think it specifically mentions AAV's, but on other sites its been stated that AAV's were not allowed in Philadelphia? It does depend on the local authority. This is a slow continuation of the above post - there have been several unexpected issues that I had to work on particularly all of the butchered joists which are slowly but surely being repaired over many weekends. At this point it was necessary to see what was going on at the main stack and if the lav was vented (it was not), so the demo is spreading slightly into the adjacent room where I had to remove a 2nd cast iron radiator to access the main stack. I've cut off all of the other drains from lav and shower leaving only the toilet drain. I have a couple of questions regarding replacing this section. Does it look possible to cut this entire section off and part of the 4" pvc pipe coming up from the floor below and lower it (using a long sweep 90 instead of closet bend) so that it is going under the joist (which I will repair). There is already a drop ceiling which is part of the 2nd floor bathroom below so I am nearly certain there is enough space under the joist bottoms. One of my other main concerns is the cast iron vent portion coupled to the pvc. Is it likely the weight of the cast iron pipe + gravity will result in this section dropping down - is there a best method for preventing this? (it's probably time to bring in a professional) I've included a few photos which i hope will help. Many thanks for any input or guidance! Many thanks! I really appreciate your input. Those wyes are handling drainage from the lav and the shower. We knew what you meant. YES! just realizing what I had put in the photo - FROM not TO!